Uses Boom Audio system or a 5"x7" or 6"x9" speaker Bad Dad's Competition Series Speaker Lids are now available for all 2014+ Touring models. This bolt-on replacement lid features a smooth contoured bodyline which looks great from any angle. The Competition Speaker Lid is designed to use a 5"x7" or 5"x8" speaker, including Harley-Davidson's Boom Audio system and J&M's Rokker system. Includes: (2) Speaker lids, (2) speaker baskets, (2) weatherstrips, (2) support braces & necessary mounting hardware. Does not include: Grilles or speakers. Grilles in photo are for reference. You can add a set of Bad Dad's grilles in the dropdown options below or use Harley-Davidson's Boom Audio grilles (PN 76000417 & 76000418). Note: This version of the Speaker Lid is the non-LED version. The LED versions shown are only for product reference. 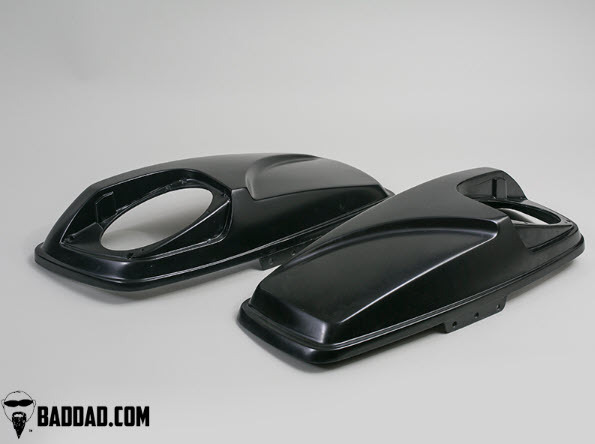 This speaker lid is designed, molded & made in the USA for your Street Glide, Road Glide, Electra Glide & Road King project. Patent Pending.